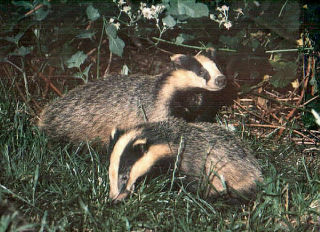 Although badgers mate at any time of the year cubs are usually born around February. They are born blind but already have their black and white stripes. The cubs stay underground in a chamber lined with dry vegetation for bedding for the first two months of their life. When they first venture above ground in April they stay close to their mother and she is very protective of them. She will carry them back into the sett by the scruff of the neck if she thinks there is danger. Later she takes them round their territory, so they can learn the best places for food. They grow rapidly and by winter they are almost as big as the adults and able to find their own food. Sadly many cubs die in their first year, particularly when there is a shortage of earthworms for food during a dry spell. Sometimes a badger mother is killed on the road when her cubs still need to suckle. If anyone finds a dead sow who is producing milk they should immediately contact the badger group with its exact location. We can then trace the sett and try to help the orphaned cubs.